Walk through a series of periods and events. Highlight key milestones in a schedule. Explain the steps in a sequence. Steps: Located on the left side of the screen, this panel is used to manage periods and events for the timeline. 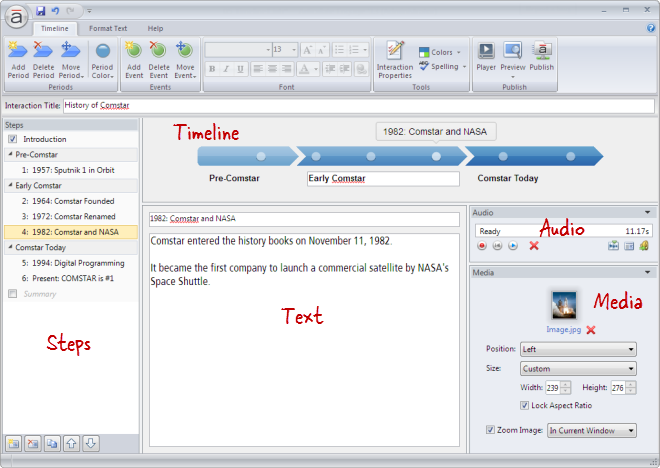 Timeline: Located at the top of the workspace, this panel is used to select periods and events for editing. It also provides a dynamic preview of the timeline's layout. Text: Located in the middle of the screen, this panel is used to add text to each event. Audio: Located on the right side of the screen, this panel is used to add and edit audio. Change the width of any panel by dragging its boundary with your mouse. 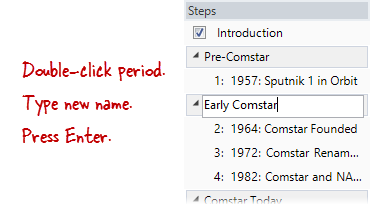 Click the triangle beside any period in the Steps panel to collapse or expand it. Each step in a Timeline interaction is called an event, and events are grouped into periods. Go to the Timeline tab on the ribbon, and click Add Period. New periods get added to the right end of the timeline (and the bottom of the Steps panel). Go to the Timeline tab on the ribbon, and click Add Event. 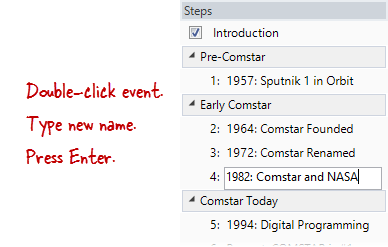 Click the Duplicate button at the bottom of the Steps panel to copy the currently selected event(s). New events get added just below the event that's currently selected in the Steps panel. If an entire period is selected, new events get added to the end of the period. Tip: A Timeline interaction can have up to 12 periods and up to 100 events per period. 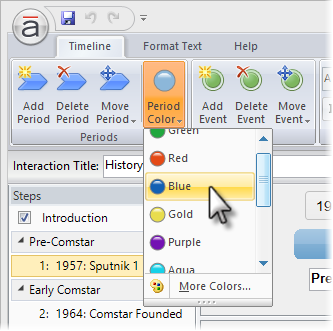 Select the period in the Steps panel or in the timeline panel. Go to the Timeline tab on the ribbon, and click Period Color. Choose one of the predefined colors, or click More Colors at the bottom of the drop-down and specify a custom color. Note: Events—the dots on the timeline—will be a lighter shade of the color of the period in which they're located. 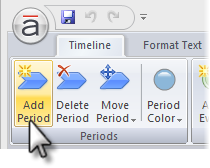 Double-click the period in the Steps panel to open it for editing. Enter the new name, and press the Enter key. 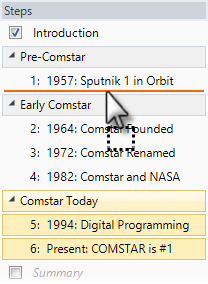 Select the period in the timeline panel to open its title for editing, and type the new name. 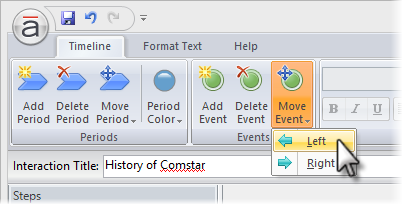 Double-click the event in the Steps panel to open it for editing. Enter the new name, and press the Enter key. 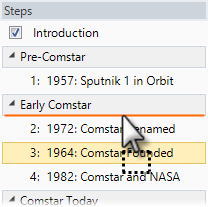 Select the event in the Steps panel, and type the new name in the title field at the top of the text panel. Here's how to change the order of periods and events. Drag them to a new location. An orange line will move with your mouse to indicate where the periods will be when your mouse is released. Go to the Timeline tab on the ribbon, click Move Period, and select either Left or Right to change the position on the timeline. Use the Up and Down arrows at the bottom of the Steps panel. Drag them to a new location. An orange line will move with your mouse to indicate where the events will be when your mouse is released. Go to the Timeline tab on the ribbon, click Move Event, and select either Left or Right to change the position on the timeline. Tip: You can change the order of events as well as the spacing between events by simply dragging them back and forth in the timeline panel. 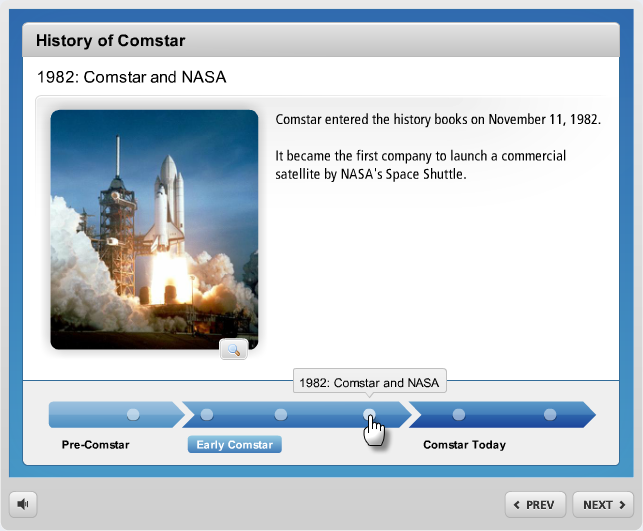 Hover your mouse over the beginning or end of the period in the timeline panel. 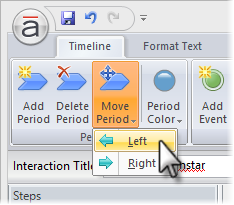 Click and drag with your mouse to shorten or lengthen the period. Release your mouse to accept the change. Go to the Timeline tab on the ribbon, and click either Delete Period or Delete Event.